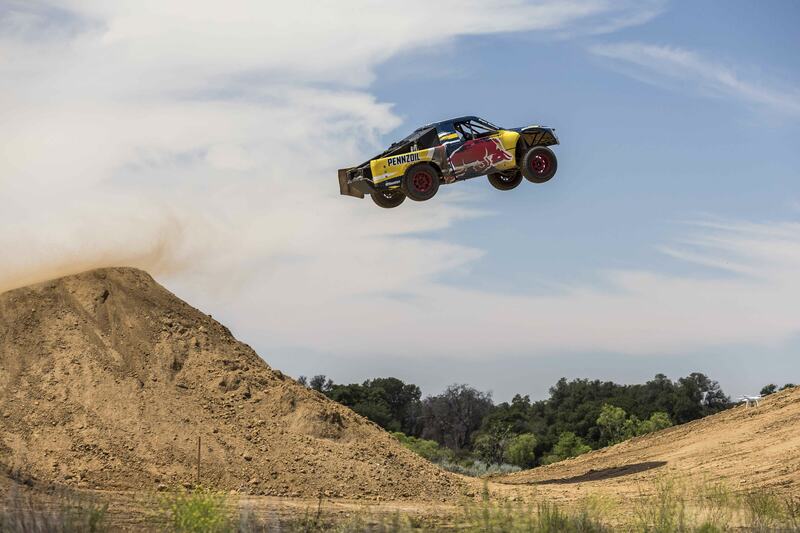 SANTA MONICA, CA--(Marketwired - July 12, 2016) - Off-road truck driver Bryce Menzies will give new meaning to the term "high noon" when he launches his Pro 2 truck over a Southwest ghost town later this year. The feat will symbolize both the progression of his career and his leap into international racing. The project, entitled "Bryce Menzies New Frontier powered by Pennzoil® Synthetics," will air live on Red Bull TV August 27 at 3pm ET / 12pm PT. The following day, NBC will air a follow-up documentary-style program detailing the full story behind the feat at 2pm ET / 11am PT. To follow Menzies' journey, visit www.redbull.com/brycemenzies. "I had the idea for this jump because it's just something that I've always wanted to do. Ever since I was a kid, I've loved jumping things -- dirt bikes, buggies, whatever," said Menzies. "And as an adult, I've really wanted to see how far I could jump my race truck. We race all the time, but we never get to come play on jumps like this, so it's awesome that Red Bull and Pennzoil are behind me and making this whole thing possible. I'm just looking forward to doing it and really having fun in the process." For the jump, Menzies will pilot his two-wheel drive Pro 2 short course truck, which boasts 900 horsepower and 500 lb.-ft. of torque, over the frontier ghost town located in the American Southwest. With only modest modifications being made to the truck, Menzies will look to exceed the current off-road truck distance record of 332 ft. The remote desert setting will echo the unforgiving landscape typical of off-road racing, with the leap serving as both a literal and figurative accomplishment for the driver. In addition to performing the physical feat itself, it will mark a new phase in Menzies' career as he widens his competitive scope to a global scale. While continuing to participate in short course and desert racing in the United States and Mexico, Menzies will extend his racing career into the international sphere. He tested the waters at the Abu Dhabi Desert Challenge in April where he secured an impressive 4th place, only fueling his desire to delve deeper into the toughest off-road races in the world. Menzies, a 29 year-old native of Las Vegas, has been a dominant force in off-road since breaking into the sport in 2007, racking up numerous wins and championships in various classes. In his relatively short career, he has won the legendary Baja 500 three times, taken first in the Mint 400, won the TORC Pro 2 Championship three times, and won Red Bull Frozen Rush twice. With the support of performance inspired sponsor Pennzoil® Synthetics, Menzies is prepared to challenge the unexpected and push boundaries as he embarks on his upcoming leap. The project is also supported by BFGoodrich® Tires, Menzies' technical tire partner for all his desert and off-road short course racing. Red Bull TV is a digital video service that features inspirational programming from the world of Red Bull, including live global events and an extensive selection of sports, music and lifestyle entertainment. Red Bull TV is available on the web, connected TVs, gaming consoles, mobile devices, and more. Accessible via the web at www.redbull.tv and its Android, iOS and Windows Phone applications, Red Bull TV is also available as a pre-installed channel on Apple TV and Samsung Smart TVs and as a free, downloadable app on Amazon Fire TV, Kindle Fire, Chromecast, Nexus Player, Roku Players, Roku TV models and Xbox 360. At Pennzoil, we're car people. We love cars and the role they play in our lives. That's why we tirelessly strive to produce the most technologically advanced, highest performing motor oils on the market. Pennzoil has made the switch to natural gas technology to make purer synthetic motor oils that lead to better performance than motor oils made from crude oil. Every bottle of Pennzoil Platinum®, Pennzoil Ultra Platinum™ and Pennzoil Platinum® High Mileage Full Synthetic motor oil is formulated with PurePlus Technology™. PurePlus Technology™ is the revolutionary process, which converts natural gas into high quality full synthetic base oil, with fewer impurities than traditional base oils made from crude oil. Feel the difference of next level performance. Make the switch. Pennzoil® is America's most trusted oil. * The full line of Pennzoil® quality products includes Pennzoil Platinum® Full Synthetic motor oil, Pennzoil Ultra Platinum™ Full Synthetic motor oil, Pennzoil Platinum® High Mileage Full Synthetic motor oil, Pennzoil Platinum® Euro Full Synthetic motor oil, Pennzoil Gold™ motor oil, Pennzoil® High Mileage Vehicle® motor oil, Pennzoil® motor oil, and Pennzoil Marine® engine oil. For more information about the full line of Pennzoil® lubricating products, motor oils and filters, please visit www.pennzoil.com. Not just oil. Pennzoil®. *Based on a survey of private motorists, between the ages of 18-64, who own or lease a car in the US, conducted by a leading market research firm between January 2015 and September 2015.